In May 2004, international Muslim Brotherhood figure Wagdi Ghoneim came to Central Ohio to speak at a fundraiser for the Noor Islamic Cultural Center, now in Hilliard. That, of course, was before he was arrested, deported, and banned from the US later that year for his advocacy of terrorism and religious extremism. He was serving as the imam for the Islamic Institute of Orange County (CA) at the time. A few months ago I reported on Ghoneim’s Central Ohio connections after Ghoneim was arrested and deported from South Africa for the same reasons. Wagdi Ghoneim: Some people eat with their left hand. What’s this supposed to be? They say: When you eat, the fork goes in the left hand. Do you eat with your left hand? You do, and then you take a drink. What’s this supposed to be? 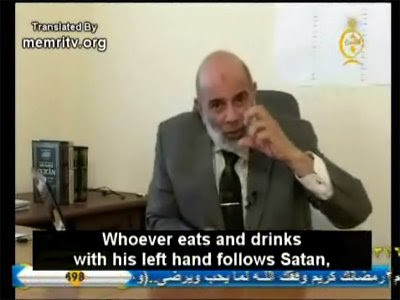 You use your left hand, and yet you claim to hate Satan?! You dare to tell me that you sense the enmity of Satan?! Allah give me the strength to resist Satan. . . Hold on a sec. The Prophet Muhammad said: “When you eat or drink, do not use your left hand, because Satan eats and drinks with his left hand.” Whoever eats and drinks with his left hand follows Satan, and whoever loves the Prophet Muhammad must eat with his right hand. But when you tell people this, they say: But Sheik Wagdi, the rules of délicat and étiquette require the knife to be in the right hand, and the fork in the left. You should cut the food with your right hand, and eat with your left. If you dare to switch — the fork in your right hand and the knife in your left — they say: “Oh, how sauvage! This is unheard of.” Brother, what délicat? You are a Muslim. When I was secretary-general of the commerce trade union, a large Iraqi delegation came, and we took them to a very big, five-star hotel in Cairo. We sat down to eat, and as I always do, I took the knife in my left hand and the fork in my right. Along comes the chef in his hat, taps me on the shoulder, and whispers: “Pardon me. . .” I said to him: “I am a Muslim!” So he said: “I’m sorry, I apologize.” I take pride in my Islam — or is Islam something disgusting, which I should be ashamed of? No. Ghoneim: Some people say: “I am left-handed. I use my left hand for everything.” I was like you. I used to eat, drink, dress, and write with my left hand. That’s how Allah created me. The moment I became religious in 1969, Allah be praised, this came to an end. There were times when Satan tempted me to use my left hand, so in order to put an end to this altogether. . . What do I eat? Rice? I eat rice with a spoon. Bread? I need to cut it first. Fine, I’ll cut the bread in advance. I prepare the water and everything. That’s it. I’ve already cut the bread. . . Then I take my left hand and place it under my left leg. That’s it, it’s stuck. It won’t come out. I take the spoon in my right hand, and the same goes for the fork. . . The hadith says that when you are done eating, you should lick your fingers clean, because you don’t know where exactly the blessing lies. You say this is disgusting because it was the Prophet Muhammad who said it, but if Michael Jackson or some nobody told you to lick your feet, you would. We are Muslims, and we follow the path of the Prophet. Oh, and don’t forget to lick your fingers after eating in the proper Quranic manner! We wouldn’t want to give in to Satan’s temptations! 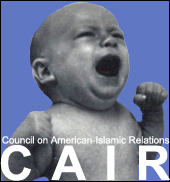 He had also referred to Jews as “monkeys” and “pigs” during a Brooklyn College conference of the American Muslim Alliance on May 24, 1998. Before leading the audience in anti-Jewish verse, Ghuneim said: “The Jews distort words from their meanings. . . . They killed the prophets and worshipped idols. The audio of Ghoneim leading a song depicting Jews as monkeys and apes can be found at the Investigative Project. All of these incidents occurred and made public well before Ghoneim’s May 2004 appearance on behalf of the Noor Center.